8 satisfying secrets of happy people | KDT Optometry - Excellence Is The Only Option! Some people always seem to be cheerful and upbeat. So what’s their secret? Turns out, it isn’t having loads of money or a perfect body, home or job. Instead, happy people tend to make time for healthy, fulfilling and feel-good activities. Satisfying relationships help us feel fulfilled. But sometimes, time with others takes a backseat to the daily grind. A tip if you struggle with this: Make a point to connect with at least one friend or loved one each day. Do you rely on texts, social media and email to stay in touch? That can be good. But don’t let technology entirely replace face-to-face time. Noticing and appreciating what’s good in your life can give you a happiness boost — even in rough times. So take moments to be grateful for a helpful co-worker, a cuddle from your pet or even just a really good hair day. Even better: Make it a practice. Writing in a gratitude journal gives you a place to record and reminisce about all that’s right with your world. People who help others tend to feel happier. 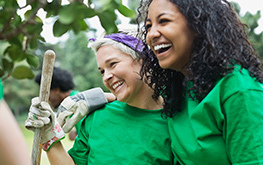 Consider volunteering regularly for a cause that’s important to you. And look for little ways every day to help out friends, family, colleagues or strangers — even if it’s just a kind word or caring ear. Do you tend to get down on yourself? Enjoy more happiness by questioning and countering your own negative thoughts. Research shows that by making positive shifts in thinking, over time, you can actually change your brain. And here’s a happy little secret: Give yourself a quick mood booster with mini bursts of activity. Even a 10-minute walk or kitchen dance party can perk you up. Pursuing creative and playful activities can make you feel good. Whether it’s playing board games or air guitar, doodling or double Dutch, encouraging your silly side can bring you joy. It’s no surprise we’re happier when we’re well-rested. In fact, getting quality sleep may help reduce the risk for anxiety and depression. Aim for a good seven to nine hours of slumber — for better health and happiness. The next time you’re faced with a negative situation, look for the silver lining. Did you manage it OK or learn something new? Nobody’s life is perfect. But focusing on the good instead of the bad can help tough times seem more manageable. Remember, you have choices. You may find your bliss by choosing those that add more meaning to your life. And that’s certainly something to be happy about.